The National Geographic Bee is an annual competition organized by the National Geographic Society, designed to inspire and reward students' curiosity about the world. 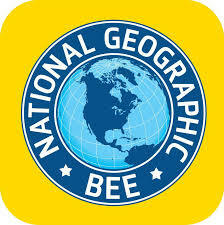 The National Geographic Bee is a competition for public schools, private schools, and home schools in the United States and its territories, as well as the Department of Defense Dependents Schools (DoDDS). Compete in a quizbowl style tournament in teams, answering questions in various geographic topics. Scored based on the number of correct questions answered. See competition website for complete scoring system.